This is a very interesting article about the the Meadowmount School of Music. The unnamed writer of the article (s/he identifies himself or herself as a lapsed cellist) suggests that perhaps quantity of practice is more important than talent. I am very excited about the International Violin Competition of Indianapolis because I will have the opportunity to go to Indianapolis to hear the final round of the competition and write about it for Strings and the American Record Guide. The competition begins on September 3, and all the rounds will be broadcast in real time over the web through the competition website. Though I don't like "competition" as a rule when it comes to music, some of my most interesting experiences, musical and otherwise, happened at an international flute competition in Budapest, Hungary. I went to Budapest to play in the competition in September of 1980, between a summer orchestral job in Graz, Austria, and a job that I was going to begin at the end of September in Schladming, Austria. Hungary was still a communist country in 1980, and its currency was "soft," meaning you could convert currency from Western Europe into forins, but you couldn't convert forins back into Western European currency. I didn't know anything about this at the time, so I converted nearly all my cash (it wasn't much) into forins, and had a blast in Budapest buying music (it was really cheap) and eating in restaurants. When it was time to leave Budapest I had what amounted to $35.00 tucked in a hiding place in my wallet, and that was the only way I could take the train from the Hungarian border to my destination in Austria. All the flutists who played in the competition stayed in the same dormitory. There were people from all over the world, and I found that the people from Eastern Europe were particularly friendly. German was the common language then, but there were a bunch of people who were excited to speak in English. I remember one flutist from Budapest invited me to her house, which was palatial. Her father was some kind of party official, and she lived a rather charmed life. I also visited with a violinist friend named Maria Vermus who taught at the music academy in Budapest and was not connected with the party. She was a great violinist, one of finest I have ever heard, but even with a teaching position at a fine school she lived in near poverty. The first round of the competition consisted of one of the Bach Sonatas for flute and continuo (the C major, E minor, or E major--I chose the E major). I remember reading through the piece with the harpsichordist who played for everyone in the competition, and then meeting another harpsichordist, a student at the Academy named Geza, who was very eager to talk (in English) about my rather funky (now it would be considered historically-informed performance practice) way of playing Bach. He also wanted to talk about Western philosophy and play some sonatas together. Geza brought up all kinds of things that I had never thought about like the different national styles in Bach's writing for flute. When I heard the Italian flutist Massimo Merceli play the C major Bach Sonata, I understood exactly what the Italian style, as explained to me by Geza, was all about. Massimo played beautifully, but he didn't make it past the preliminary round. When it was time for me to play I completely re-thought my E major Sonata, and I played it in the Italian style. I had a wonderful time pIaying, and was really happy to have gotten new musical insights from Geza, the Hungarian harpsichordist, and from hearing one of my fellow competitors play in a way that was truly beautiful. I didn't make it into the semi-final round either. Maybe the judges, who I believe were mostly French, didn't particularly like the Italian style of playing Bach. Who knows. I had a great time in Budapest after the prelimary round was over. I can't remember who won the competition, but I do know that Massimo, who played in a way that really meant something, has a career as a soloist now. I just learned from my husband Michael that Pluto was voted out of our solar system. It is indeed a sad day in my house. The only consolation for me is that the solar system as described musically in Gustav Holst's The Planets from 1916 once again reflects the current "face" of our solar system. My mother was a flutist until she was no longer able to play because of an operation she had on her hands. Though she has had arthritis since she was a little girl, she was still able to play flute until she was in her forties. I started playing the flute (her flute) when she stopped. When she had to stop playing she decided to follow another creative path and became a painter. The paintings I remember from my childhood were not particularly impressive--mostly trees and flowers. 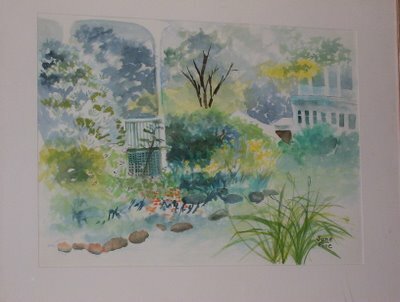 She studied and worked very diligently at her painting while I moved to Illinois and raised a family of my own, so I saw very little of her more mature work. I was proud of my mother's accomplishments as a painter, and I liked the paintings I had seen, but I had no idea about the scope and quantity of her work. My mother's vision has been deteriorating for the past ten years, and she is now completely blind. She asked me if I would like to take some paintings home with me on my next visit. My next visit was this past week. I felt odd taking paintings off her walls, but It felt wonderful to be able to have a piece of my mother's lost vision. That she was able to acquire enough technique to capture what she saw was a great gift. She put a tremendous amount of love into her work, and it is still there in her paintings. Her love can hang on my walls, and I can see it and feel it any time I want. My mother also let me have her flute. It was the flute I practiced on for hours and hours every day during the first two years I played. She had extra keys and levers put on the instrument to make it possible for her to play it (they didn't really work--the surgeon she had put a pin in her thumb so that she couldn't bend it enough to hold the flute). I played it in her living room the day before yesterday. I played the siciliano from the Bach E flat Sonata, a piece I haven't thought about in years. It felt unusual and exciting to play, bringing back my tactile and aural memories from playing the instrument when I was 14, and feeling the similarity of my "voice" and my mother's "voice." For the second summer in a row a friend and I have "run" a program that we call "Summer Strings." We meet once a week during about 8 weeks of the summer, and we play music. The general favorites are pieces by Handel, Vivaldi, and Mozart, but we also mix things up with arrangements of show tunes and music from movies. Since there is not that much music for string orchestra that is accessible to younger kids, we play a lot of "custom" arrangements (in other words, quartet arrangements I have made over the years) of pieces. We have unwritten and unspoken guidelines for our group: anyone of any age and any playing level can come and play, nobody is required to come, it doesn't cost anybody anything (the local arts council gave us money for photocopying) anyone can sit wherever he or she wants, nobody practices the music (they can't--it stays in the place we play), anyone can make comments and tempo suggestions, and we do not have a conductor. At the beginning of each summer things are a bit rough. People are shy and a bit insecure. By the end of the summer we have real music making. Without having to be told in any way at all, the people who participate in Summer Strings know the social and musical rewards of practicing, and they learn the joy of playing music in a situation that is totally devoid of pressure. I'm really looking forward to next summer.